A budoka should regard her/his school and its attendants as a surrogate family. A special bond is formed after years of training among long time students in the spirit of camaraderie and friendship. In fact, quite often, a group soul or collective personality prevails in many well established schools. A successful school from my area I know of features black belts that all fight in a similar kiba dachi stance, utilizing multiple spot-side kicks, and rapid fire punching sequences. I admire that dojo, not so much because of the fighting prowess of its exponents, but because of the unity and passion these karate-ka bring to their art. Other schools work from a different script, however. Instuctors should be cognizant of how their students behave amongst themselves. The sempai (senior students) are expected to act as role models, particularly during sparring sessions. If an over-zealous sparring match erupts into a brawl, both players leave the deck with residual animosity. In the name of toughness and machismo, some students are intent on simply beating the living daylights out of one another. Clean technique and precision of form goes by the wayside. I realize that heavy fighting has its place, but only with the understanding that it helps the trainee get an idea of how intense an actual streetfight really is. While combat effectiveness is imperative in any art, it should never undermine the integrity and inherent values that belong to any self respecting martial arts school. Ha! Let's hope that everyone elevates is own soul a bit each day. Very good point. Sparring was a learning tool for me until I sparred with a higher ranked teenager who kicked me so ridiculously hard that I got a terrible bruise on my leg from it. 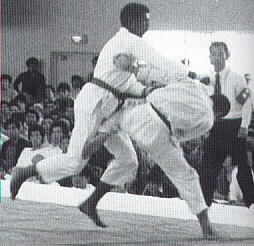 I really think that sparring should be done only with the black belt instructors until techniques are perfected and there's an understanding of how things are supposed to happen. Otherwise, as you said, animosity can and does happen. I've seen the kind of pervasive "spirit" that you mention permeate the students of a dojo, and yes, I agree that the sempai create the atmosphere by echoing the heart, and expectations of the Sensei. I feel extremely grateful that I have found a home in my dojo wherein I feel that I fit into the "spirit" there. Consider yourself lucky for finding a dojo you can call home. We have a student at our school who is around my age (38) and is a male. He is my sparring nightmare. His macho behavior is dangerous, in my opinion. He feels that he needs to kick you as hard as he can to show us he's a man. Mind you his form and control is virtually non existant. I feel like I'm risking injury every time I spar him. Of course, being injured right now I get a break from him but I feel it's the responsibility of our head instructor to teach him proper sparring behavior yet I am still waiting for this lesson to be taught. For some people it's all about the winning and not about the learning. Is the chief instructor of your school aware of your "sparring nightmare"? He (the instructor) has a responsibility to the safety and welfare of her/his students. You shouldn't be risking anything (this school is risking losing you as a student!) --if you haven't already, it's time to make yourself seriously heard, the sooner the better. Love your "rules of engagement" in my comments section. I'll try to watch the instincts. . . try. You need to update more often. I look forward to reading what you have to say!